Facebook turns 10 tomorrow and reaches that milestone as the dominant social networking platform, used by 57% of all American adults and 73% of all those ages 12-17. Adult Facebook use is intensifying: 64% of Facebook users visit the site on a daily basis, up from 51% of users who were daily users in 2010. Among teens, the total number of users remains high, according to Pew Research Center surveys, and they are not abandoning the site. But focus group interviews suggest that teens’ relationship with Facebook is complicated and may be evolving. 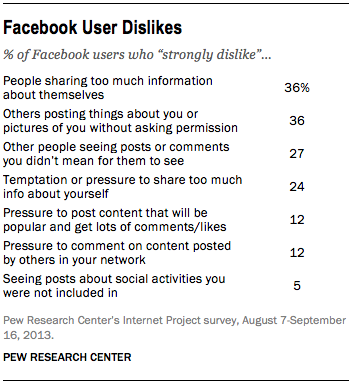 New Pew Research Center survey findings show how people are using Facebook and what they like and dislike about the site. 11Some users dislike certain aspects of Facebook, but fear of missing out on social activities (or “FOMO”) isn’t one of them. Their dislikes start with oversharing by friends and people posting one’s personal information (such as photos) without first asking permission are among the most common. Parents are especially protective of images of their children, as 57% of Facebook users with children under the age of 18 say that people posting pictures of their children without asking permission first is something they strongly dislike about using Facebook. On the other hand, the “fear of missing out” phenomenon resonates with only a small proportion of the Facebook population. Just 5% of Facebook users strongly dislike the fact that Facebook allows them to see others taking part in social activities that they themselves were not included in—and 84% of users say that this aspect of Facebook life doesn’t bother them at all. 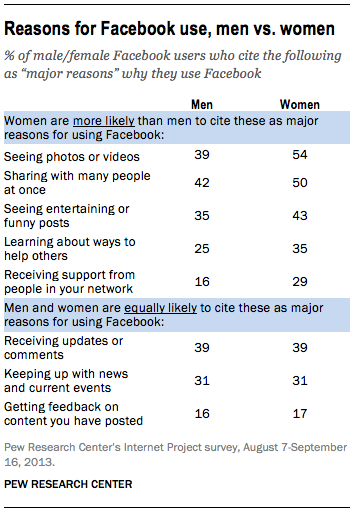 22Women and men often have varying reasons for why they use Facebook – but everything starts with sharing and laughs. Users say they especially appreciate photos and videos from friends (47% say that’s a major reason they use the site), the ability to share with many people at once (46% cite that as a major reason), updates from others (39% cite that), and humorous content (39%). Other aspects of Facebook—such as keeping up with news, or receiving support from the people in one’s network—appeal to a more modest audience of users. Men and women sometimes vary in their reasons for using the site. 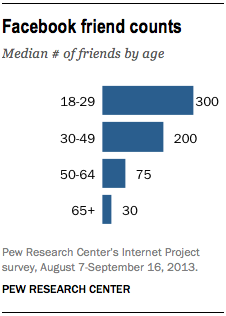 33Half of all adult Facebook users have more than 200 friends in their network. Younger users tend to have significantly larger friend networks than older users: 27% of 18-29 year old Facebook users have more than 500 friends in their network, while 72% of users age 65+ have 100 friends or fewer. 4412% of Facebook users say that someone has asked them to “unfriend” a person in their network. Younger users are more likely to have experienced this than older users: 19% of 18-29 year old Facebook users have had someone ask them to remove a friend from their network (compared with 10% of 30-49 year olds, 7% of 50-64 year olds, and 5% of those 65 and older). These “friend removal” requests tend to come primarily from other friends (35%), or from current (23%) or former (12%) spouses or romantic partners. Some 38% of those who received this type of request say that they were asked to remove a friend from their Facebook network, while 22% were asked to unfriend a former romantic partner. 55Facebook users “like” their friends’ content and comment on photos relatively frequently, but most don’t change their own status that often. 44% of Facebook users “like” content posted by their friends at least once a day, with 29% doing so several times per day. 31% comment on other people’s photos on a daily basis, with 15% doing so several times per day. 19% send private Facebook messages to their friends on a daily basis, with 10% sending these messages multiple times per day. 10% change or update their own status on Facebook on a daily basis, with 4% updating their status several times per day. Some 25% of Facebook users say that they never change or update their own Facebook status. 66Half of internet users who do not use Facebook themselves live with someone who does. Many non-Facebook users still have some familiarity with the site through family members. Among internet users who do not use Facebook themselves, 52% say that someone else in their household has a Facebook account. In many instances, these may be parents who do not use Facebook but live with a child who does. Fully 66% of parents with a child living at home who do not use Facebook themselves say that someone in their household has a Facebook account. In addition, some 24% of Facebook non-adopters who live with an account holder say that they look at photos or posts on that person’s account.